Haihaisoft provides a series of solutions, including Web Page Security, Enterprise DRM solutions, Secure File Sharing, DRM solutions Mobile Phones (Android and iOS) , media batch encryption, dynamic website protection to customers' needs. Our solutions are deployed by companies in the education, consumer electronics, software, information publishing and corporate IT markets to solve industry-specific challenges. The Leading DRM Provider in the Digital Rights Management Industry! Haihaisoft's development team has rich experiences in ASP, ASP.net, PHP, and JSP enables integrate your existing or other third-party systems seamlessly and remain open to customization. Accommodate your requirements to increase your revenue as your business model changes. Integrates with Haihaisoft DRM-X and payment gateway seamlessly. In addition, you get support from experts who work with you to understand your requirements and ensure a successful deployment by combining a set of proven services and technologies. Our customers see the results of our development philosophy in our ability to adapt to a fast-moving market, flexibly improve our services, and integrate the emergent tools their businesses require to gain a competitive advantage in the digital content market. Format media and metadata correctly, create e-books and integrate with existing systems, and publish to your delivery networks. Define sales and license policies to get more from advertising, subscriptions, or pay-per-download. Help your customers find your content from more locations by distributing your media and eBooks on other sites and platforms. 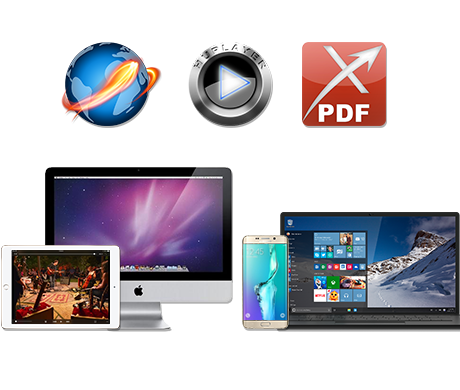 Rapidly web browser, video player and PDF reader for a more compelling consumer experience. Amass, format, and tag content from many sources, ensuring they meet your specifications. Define ad placement, license and pricing, and protect content security. Authenticate users, define business and license policies, and report on usage. Haihaisoft provides customized solution for you to meet your business needs. If you need other solutions, please feel free to Contact Us. Encrypt your company web pages, it includes important data like technical document, financial report and so on. Only authenticated users can visit, and visit it under your control. For example, you can disable print, text copy and view source. Encrypt your PDF document, and convert your Office document to HTML or PDF, and publish the protected document to your website. Protect your document security with DRM-X 4.0’s advanced DRM protection. For companies that require enterprise DRM for documents, audio/video and images, you can easily integrate DRM-X 4.0 with your current website. After integration, your user login with your website’s username & password to view the protected file, and the license acquire page and styles can be full customized to yours.